THE RIDERS ADVANCED at a four-beat gait on an unpaved track that bisected swatches of hilly farmland. Flint jingled under their donkeys’ hoofs. The tiny mirrors sewn into the skullcaps of the men and the enormous homespun silk scarves of the women shimmered in the sun, reflecting fragments of their world: the cerulean fields of chicory, the emerald slopes of winter wheat, the quivering gold of Afghan road dust churned up by their procession and suspended between heaven and earth. Slightly to the riders’ side, their sheep ambled along a narrow rim of shade where rowan trees drooped with the saccharine blossoms the women believed to be an aphrodisiac. The dazzling caravan drew closer and I raised my notebook and pen in the universal plea for journalistic alms. The riders, both women and men, raised their hands in greeting. They did not slow down. 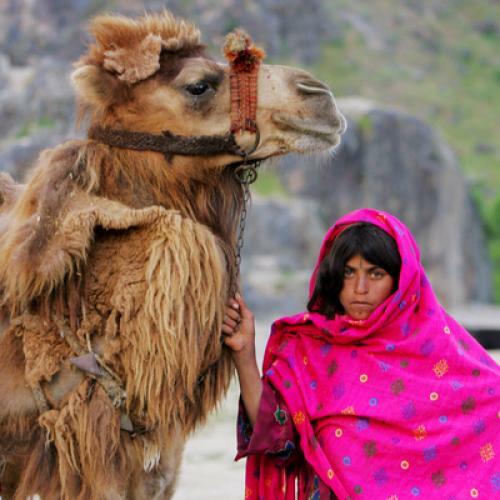 They were Kuchi tribespeople: nomads who wander with the seasons between the vertiginous mountains of Afghanistan and the lowland pastures of Pakistan in a stately minuet of annual migration. They were not about to break their pace for me. They were not about to break their pace for anyone. They had been riding at this pace through this land, year after year, for centuries. Patiently, they had skirted stretches of oily, ocher-colored quicksand and had bravely pushed their animals through the bruising patches of camel-thorn bushes and burning salt flats. a thousand shades of gray and brown, with which it tinted its hills, its sands, and its earth. There were subtle changes of color in the blackness of the nights and the brightness of the days, and the vigorous colors of the tiny desert flowers hidden in the dusty bushes, and of the gliding snakes and scurrying lizards as they buried themselves in the sand. Ahmad, who is eighty years old and lives in Islamabad, may be an outsider, but he is not a newcomer: he spent decades working as a civil servant on development in western Pakistan and at his country’s embassy in Kabul. Exoticizing his characters—the washed-up former mountain guide who sells his daughter into marriage for a pound of opium; the deranged double-crossing mullah; the man who kills his beloved to protect her from her husband’s wrath—would have been easy, but it would have been a cheap trick. Instead Ahmad lifts the veil from their little-known culture delicately, respectfully, allowing us a look without violating their privacy. We learn of women who insist on taking their chicken on months-long desert treks and shame their husbands into battle; of men who sell women into prostitution and cheat their way out of revenge killings by wearing children’s clothes—for the Pashtun honor code, Pushtunwali, prohibits visiting revenge on children (this, too, we learn from the novel). Ahmad does not romanticize the tribespeople, nor does he condemn them. One gets a sense that he truly loves them, accepting them in their entirety, with their strengths and their flaws. A migrating herdsman accepts both an unexpectedly lush pasture and a relentless sandstorm this way. Nostalgia, writes Svetlana Boym in her fine study of the subject, “is a yearning for a different time—the time of our childhood, the slower rhythm of our dreams.” The Wandering Falcon, then, is an indelibly nostalgic novel: it honors the slower rhythm of a threatened lifestyle. In Ahmad’s novel and in real life, the traditional paths of tribespeople increasingly collide with a formidable enemy: modernity. Both the nomads’ cyclical pilgrimage and the ancient honor-code-based order of the settled tribes are at risk in a land where more and more often high-tech warfare, checkpoints, paved roads, and borders dictate the dispensation of their justice and the course of their journeys—in sum, where the accoutrements of what we call progress interfere. Their migration routes and system of government were first disrupted by the British demarcation, in 1948, of the 1,600-mile border between Afghanistan and Pakistan, which divided the tribes, and destabilized further in the 1980s, when the United States and Saudi Arabia poured approximately $1 billion a year in weapons and training of anti-Soviet mujaheddin in the tribal areas. In the ’90s, Pakistan used the region to train, fund, and dispatch militants to fight Indian forces over the control of Kashmir. Today the Taliban use it as a training base and safe haven and American drones drop bombs on it. The firing was indiscriminate. Men, women, and children died. Gul Jana’s belief that the Koran would prevent tragedy died, too. Dawa Khan fell dead in the raking fire. There is no gratuitous violence in this scene of carnage. There is deep melancholy. The Wandering Falcon is a glimpse into the volatile tribal belt that today potentially holds the key to ending, or prolonging indefinitely, America’s longest war. Shamefully, it is a region the majority of Western readers knows about either as “Pakistan’s tribal badlands,” a common journalistic shorthand, or through the racist brush-offs of earlier invaders. Winston Churchill called its inhabitants “a numerous population in a state of warlike leisure,” not to mention “savages of the Stone Age.” The journalist David Rohde, whose account of his seven months in Taliban captivity in western Pakistan in 2008 and 2009 may be the most insightful look to date at the way fundamentalist insurgents there operate, describes it as “a backwater roughly the size of Massachusetts . . . dominated by Pashtun tribes known for their independence, criminality, and fighting skills.” To many a Western eye, the people who inhabit this region are almost cartoonish, two-dimensional stick figures. Ahmad’s exquisite book breathes life into them. Anna Badkhen is the author of Peace Meals: Candy-Wrapped Kalashnikovs and Other War Stories and Waiting for the Taliban, now available in paperback. She is writing a book about timelessness.